This 9-day lodge safari will take you to the well-known conservation areas in the south of Tanzania. You will visit national parks such as Mikumi, Udzungwa, Ruaha and the Selous Game Reserve with a safari vehicle, on foot and by boat. Apart from the safari activities, there will be time to meet the local people and see how they live. 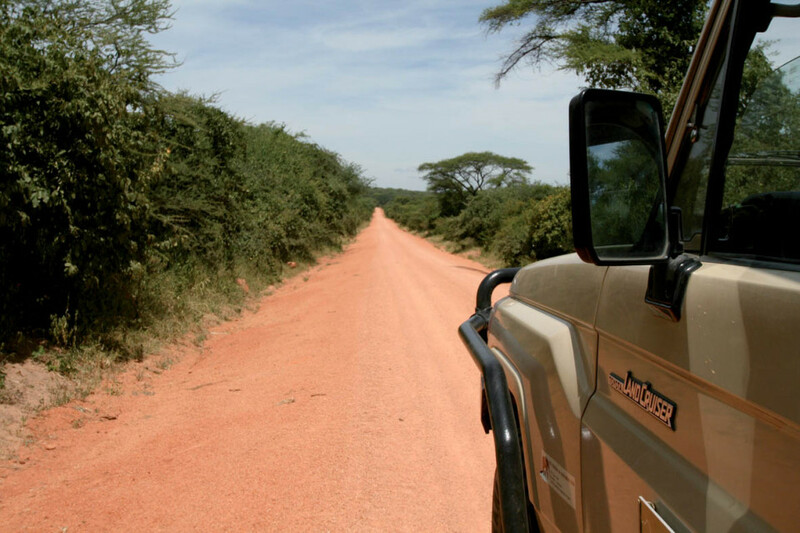 Due to the long distances in the southern part of Tanzania, the safari is a combination of a driving and fly-in safari. 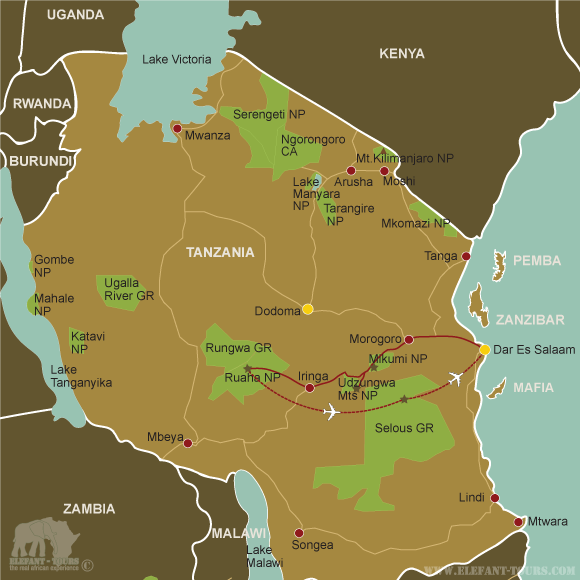 This gives you the opportunity to explore the whole south of Tanzania while travelling time is limited. Your guide will meet you at your hotel in Dar es Salaam or at the airport and you will leave the bustling capital and its chaotic traffic in the morning. After about five hours driving on a good tar road you should reach the eco-friendly Stanley’s Kopje Tented Camp in Mikumi National Park, just in time for lunch. The tents are built wooden platforms on a hill with verandas overlooking the landscape below. Later in the afternoon you go for a game drive in the national park to see animals such as elephant, lion, giraffe and herds of zebra, wildebeest and buffalo. Bird-lovers should be able to tick off a few of the more than 400 species that occur here during the rainy season. Mikumi National Park is the third biggest park in Tanzania and the seemingly never-ending Mkata plains in the northwest of the park feel like the Serengeti. It is an important educational centre and students study conservation and ecology here. 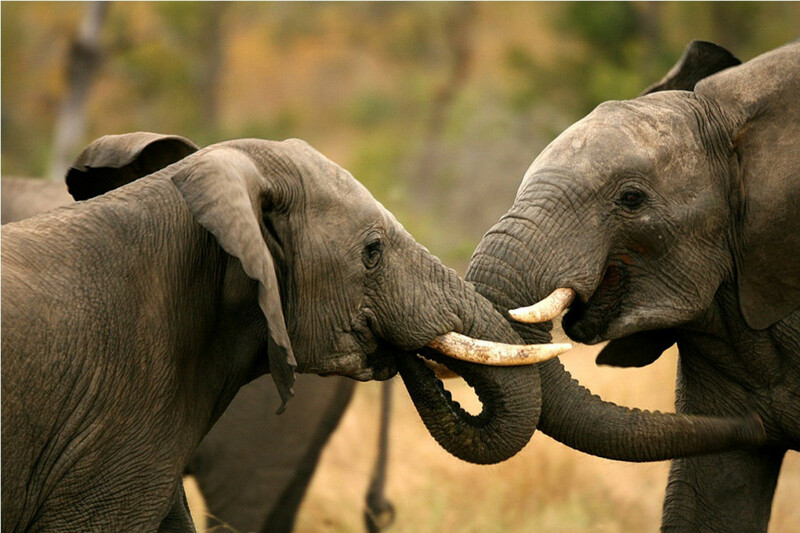 Mikumi is well-known for its big buffalo herds, large elephant population and a sub-species of giraffe. 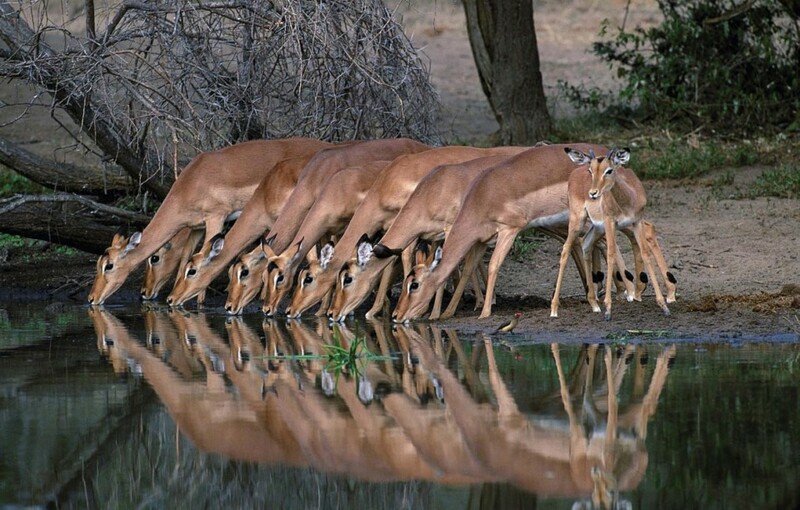 Other creatures you might see include zebras, leopards and the world’s largest antelope, the eland. After a full day in the wilderness, you will return to Stanley’s Kopje Tented Camp in the evening. Rise and shine! 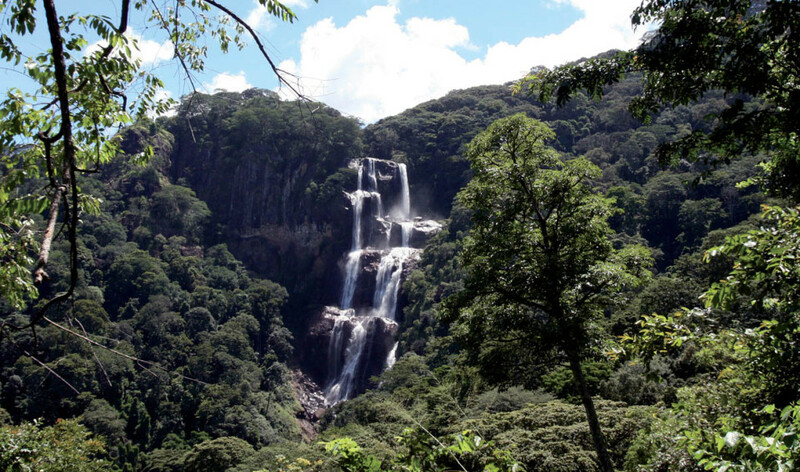 After an early breakfast, you will drive approximately one and a half hours to the Udzungwa Mountains to hike in the national park. The park is not accessible to vehicle and can only be explored on foot. The lush rainforest is home to many endemic plants and animals like the Udzungwa red colobus and the rare sanje mangabey - a grey monkey living mostly off fruit on the forest floor. The cute little grey-faced sengi a type of elephant shrew was discovered here in 2008. A highlight of the walk is the Sanje waterfall. Three huge cascades of water falling into natural rock pools in the lush forest are perfect for swimming. In the evening, you will drive back to Stanley’s Kopje Tented Camp. After breakfast you travel south towards Iringa. On the way, you pass the scenic valley of the Great Ruaha River where some majestic baobab trees are growing. The river provides sustenance to more than 6 million people – for agriculture, fishing and drinking water. The destination of today is the, 40km away from Iringa. After arriving at the Kisolanza Farm & Guesthouse in the afternoon, there will be time to explore the farm, its gardens and the surrounding area. The Ghaui family has been growing vegetables, flowers and tobacco for more than 100 years. Taste the fresh farm products during dinner and overnight at the rustic cottages of the farm. Today, you drive towards Ruaha National Park and you might stop at the local market in Iringa, the biggest city of the province. Here you will find anything from fresh fruit to second-hand shoes, wooden crafts and baskets. After a drive through local villages, you will reach Tandala Tented Camp where you will stay for two nights. Tents are built on wooden platforms and have views of the river and animals that come to drink at the waterhole. In the afternoon you will go on a game drive in Ruaha National Park. Ruaha National Park is the largest game reserve in Tanzania. Due to its size and the fact that the southern Tanzania is less visited than the northern parks, you will able to enjoy the peace of this less touristy wildlife area. The life vein in the park is the Great Ruaha River with huge numbers of crocodiles and hippos. 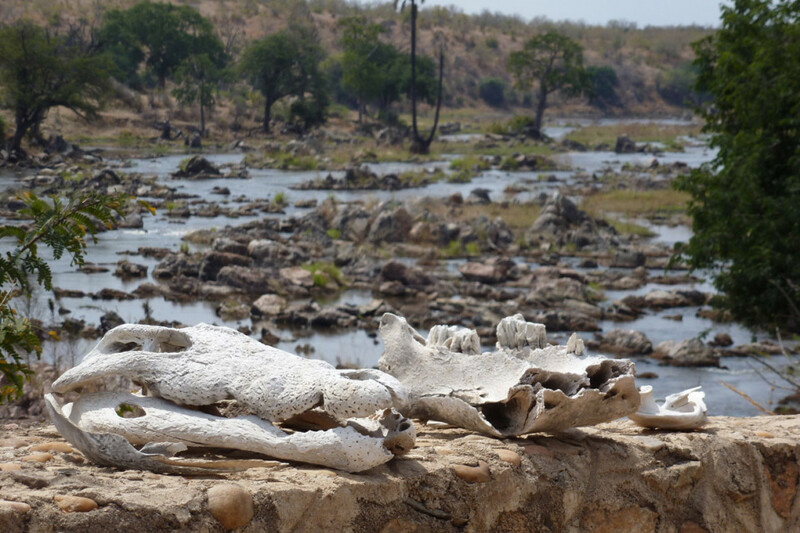 The drier Ruaha National Park gets, the more the animals of the park are concentrating around this lifeline. During the dry season, you can see thousands of elephants (about 10.000 elephants live here), buffalos, lion and rare animals such as wild dogs. Kudu, roan and sable antelope should be spotted in the miombe woodlands. The wet season is the best time to see flowers and birds – more than 370 species. After a dusty day on safari, you will return to the pool set under a baobab tree at Tandala Tented Camp. 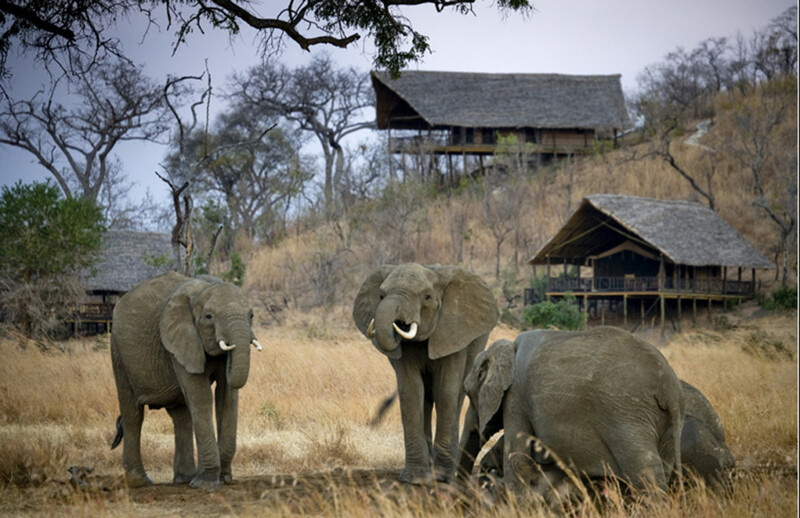 In the morning, you will join a local guide on a bush walk in the area around Tandala Tented Camp. After lunch you will fly to Rufiji River Camp where you will spend two nights on the banks of the Rufiji River.The game reserve was awarded a UNESCO World Heritage Site status for to the diversity of wildlife and its unique ecosystem. Selous Game Reserve is the biggest wildlife conservation area in Africa and with Mikumi and Udzungwa national parks form an area as big as Switzerland. Habitats include grassland, savannah with acacia trees, swamps, wetlands and extensive Miombo woodlands. The mighty Rufiji River with its lakes and swamps teeming with fish, lure a vast selection of water birds and is home to hordes of hippos and crocodiles. The reserve has more than 2 100 plant species, over 100.000 buffalo, 60.000 elephant and 1.300 wild dogs. From your camp, the Rufiji River Camp, you will explore this unspoiled wilderness on game drives and go on a boat cruise on the Rufiji River through the channels and lakes. Here you will see animals from a different angle as they come for baths and sundowner drinks at the river. After breakfast there will be time for another game drive before you will be dropped off at the airfield from where you will depart to Dar es Salaam or Zanzibar.